This article submitted by Linda Stelling on 7/28/99. Diane Kodet (left), Paynesville, has been named as the new assistant vice president and relationship manager #2 at the Community First National Bank. She will fill the vacancy left by Audrey Olmscheid (right), who has taken a position at the Stearns County Courthouse. Olmscheid had been with the bank 28 years and felt she needed a career change. She will work as a screener collector at the courthouse. "I enjoy working with the public and this job will still allow me to do that. I will be working with a team of four to five people," Olmscheid said. "I have enjoyed working at the bank. My new position will give me more hours at home, providing me more family time," Olmscheid added. "I have worked with Kodet and know she is qualified for the job," Olmscheid stated. 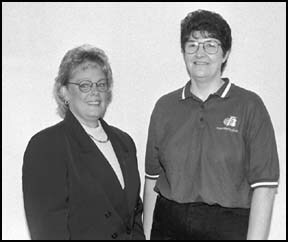 Olmscheid started her banking career in 1971 in Alexandria and moved to Paynesville in 1975, working as a teller. "I have been fortunate to have worked under five bank presidents who have promoted me over the years," Olmscheid said. Olmscheid plans to remain active in the community. She is a member of her church finance committee, on the Community Service Center Board, and the city of Paynesville Planning and Zoning Board. Kodet has worked in the financial field 15 years with Star Banking System, the Marquette Bank System, and GFS Mortgage in St. Cloud. Kodet was curently a branch manager with Star Banking. She will be working with Olmscheid this week, learning the computer programs, meeting clients, and area realtors. Kodet has worked in every phase of banking from the mail room to proof operations, accounting, and mortgage. "I'm looking forward to learning the system and meeting everybody," Kodet said. Kodet lives in rural Paynesville with her husband, Allen, and three teenage children.